Either bake up a batch of these skeleton gingerbread men cookies to present to your Valentine, or gift the cutters to your favorite goth baker. 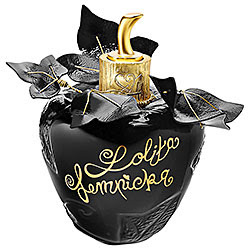 Who cares what it smells like (though I love iris and jasmine scents) - the bottle is so beautiful. (Pity about the hideous yellow on the box, which I'd throw away). Great for adorning a goth maiden's vanity table. Also available on Amazon and on eBay.